Roberto Clemente – his name evokes memories of heroism and passion, grace and pride. Truly among baseball’s elite, he is the benchmark by which champions are measured even today. Whether diving for a ball in right field, leaping above the outfield wall to make an awesome catch, or connecting on one of his 3,000 hits, Clemente did it all! 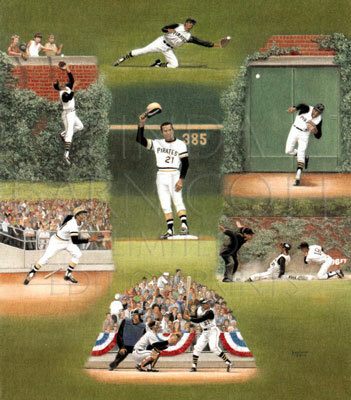 Linda Barnicott captures Clemente’s remarkable career with a beautiful limited edition print entitled “Remembering Roberto Clemente”. It’s sure to become a collector’s dream!